Dr. Moore received his Bachelor of Science degree in Zoology from Michigan State University. He received his Doctorate of Dental Medicine from the University of Pennsylvania, as well as a Master’s degree in Education. While serving in the US Air Force, Dr. Moore received Advanced Education General Dentistry (AEGD). He was assigned to bases in Alabama, Virginia, England and Ohio, and later went to Indiana Air National Guard when he bought his practice in 2001. 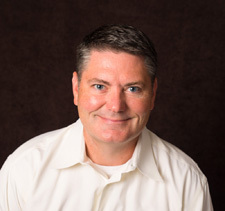 Dr. Ken Moore is a practicing member of the American Dental Society Of Anesthesiology (ADSA), a society dedicated to continuing education and the advancement of anesthesia and sedation science. ADSA is well known for providing education and fellowship status in minimal and moderate sedation & general anesthesia for dentist anesthesiologists and oral/maxillofacial surgeons. This advanced training ensures our patients receive the highest level of pain management and post procedure comfort. Dr. Moore has been practicing in Bloomington since 2001 and is currently, among other things, the team dentist for Indiana University. He takes care of athletes and coaches from all sports. Dr. Moore and his wife Robyn have three children. In his spare time, Dr. Moore enjoys playing golf, reading history, and watching college football.